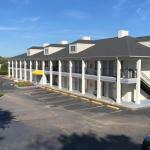 With its central location and fitness center the colonial-style Baymont Inn & Suites - Orangeburg offers our guests country inn-style accommodations. This two-story pet-friendly hotel has 60 rooms some of which are designated non-smoking. Each room offers pillowtop mattress a work desk cable TV with premium channels and a coffeemaker. Select accommodations include a mini-fridge and microwave. Guests can enjoy a workout in the on-site fitness center. This property is located two miles from Hillcrest Golf Course Orangeburg Arts Center and Orangeburg Civic Ballet. Edisto Memorial Gardens are five miles away South Carolina State University is three miles from the hotel and Santee State Park is 30 miles away. Columbia Metropolitan Airport is 33 miles from the property.